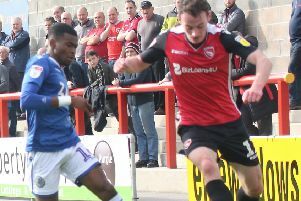 Morecambe manager Jim Bentley admitted their win against Crawley Town gave him a headache in more ways than one. The Shrimps’ boss saw his side win three consecutive league games at the Globe Arena for the first time on Saturday as they climbed to 18th in the League Two table. Liam Mandeville’s late header gave Bentley’s players a 1-0 win to follow up their previous home victories against Forest Green Rovers and MK Dons. It is the club’s best league winning run at home since the run of six victories which brought down the curtain on their time at Christie Park in 2010. Saturday’s win was in no small part down to the second-half changes which saw Mandeville and Andy Fleming come on and remind Bentley of their capabilities. 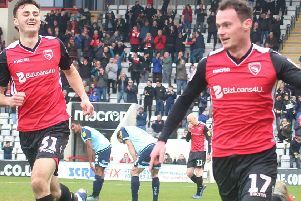 All of a sudden, a hitherto listless Morecambe side looked brighter going forward and it culminated in Mandeville’s intervention, settling a scrappy game which will not last long in the memory. Bentley said: “I’m glad it’s over, it was a horrible game to be involved in. “My head’s banging; when you’re playing a team in and around you, you’ve always got to guard against teams having a bit of an upturn in results. “You can’t affect anything else that goes on around the country, so it was a massive game for both clubs. “We’ve been beaten comfortably last week, we’ve won the last two times here and you’re hoping you can get the result whichever way it comes. “Today, I thought it was a poor game; the pitch didn’t play well, they had better chances than us but how many times have I been stood here, earlier in the season when we’ve been beaten and clapped off the pitch? “It was one of those games where you get over the line and get a win; I don’t think it was a great performance but, the psychological effect and the position we’re in, you look at the other results. “No-one would have expected Macclesfield Town to get a point at Lincoln City, Notts County going away and winning 3-0, so if you lose today it closes up a little bit but the most important thing was getting the three points. “I’m not particularly happy with certain aspects of our play but it’s a win in front of our home fans on a big day. “We’ve kept a clean sheet; I thought Barry Roche did well, the two centre-halves (Sam Lavelle and Steve Old) were superb so there were plenty of positives there. “The biggest positive obviously was winning the game so we’ll take it as it comes at this stage of the season.